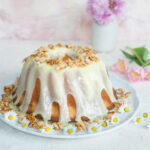 Moist and fluffy almond bundt cake covered with white chocolate. The chocolate is also added to the batter, so the cake tastes amazing and is rich and moist. You can really taste the almond flavor! The cake is sprinkled with caramelized flaked almonds, which are seriously addicting! Are you looking for other bundt cake recipes? Check out this chocolate orange bundt cake. Why this almond bundt cake is the best? – crispy caramelized flaked almonds – elevate the cake to another level! 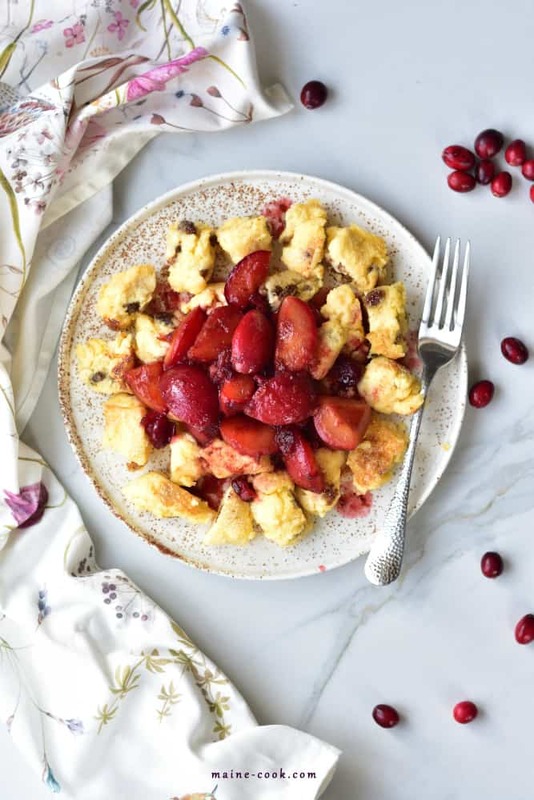 This cake is made a little differently – instead of a more traditional method – creaming butter with sugar, butter and chocolate are melted and egg whites are whipped. This results in fluffier and more delicate cake (I made it both ways!). 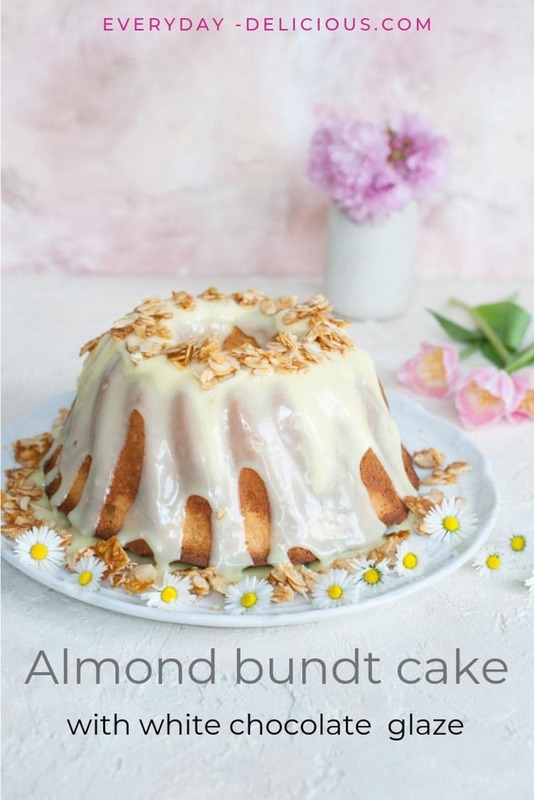 This almond bundt cake can be stored for up to 4-5 days, in a tightly closed container, in a cooler place. It tastes best on the day of baking, but it’s also very good the second day. Sprinkle sugar in a single layer on a pan, heat until dissolved and golden. Stir in the flaked almonds and butter. Transfer on a piece of baking paper, wait for it to cool down then break into smaller pieces. These almonds are super addictive – crunchy, intensely almondy and covered in sweet caramel. What‘s not to love! I urge you to make more and store in a jar, then sprinkle on other desserts or ice cream. Continue to heat the chocolate in a water bath over low heat. In a second pot, heat a small amount of milk, it should be very warm but not boiling, add it slowly to the chocolate, whisking constantly until the ganache is smooth and glossy. If the chocolate glaze is too thick, you can add a little more cream or milk to thin it, but it must be very warm, at a similar temperature like chocolate (otherwise it will split). How does broken ganache / chocolate / chocolate glaze look like: it‘s lumpy, grainy, white chocolate can form a firm block and even though you heat it, it won‘t dissolve. 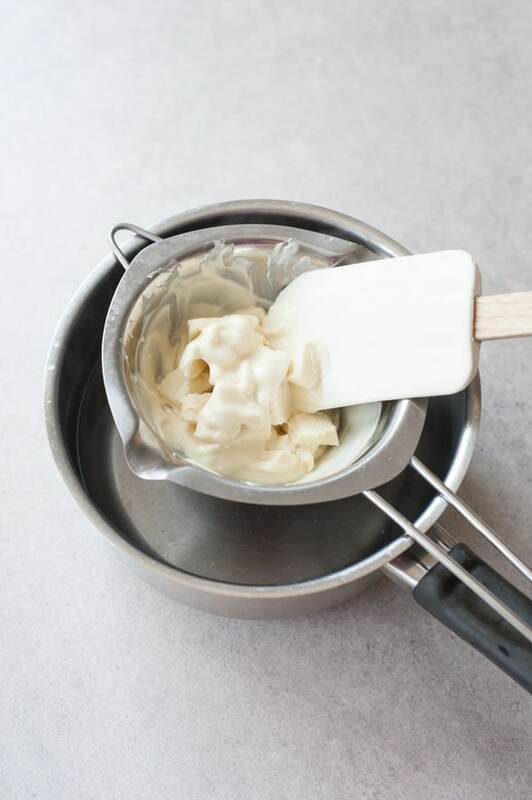 How can this happen: for example, when you add cold or even at room temperature cream to already molten chocolate or even a little water to the melting chocolate. 4. Mix flour, ground almonds and baking powder together. 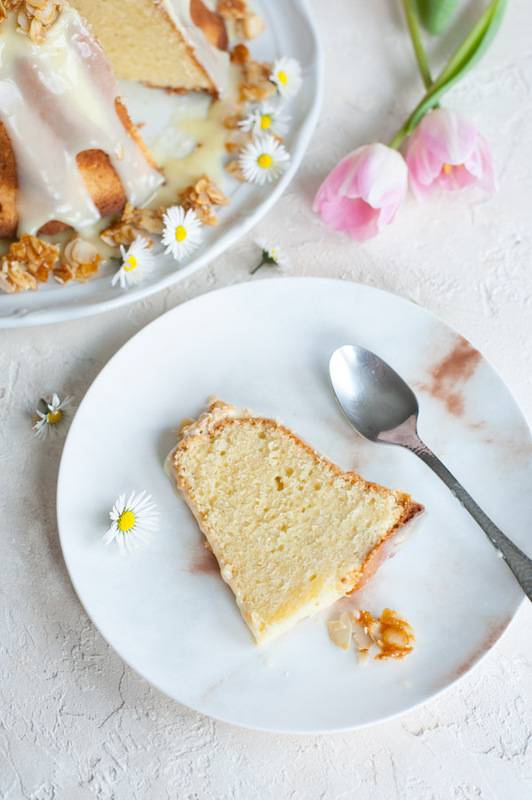 Moist and fluffy almond bundt cake covered with white chocolate glaze. The chocolate is also added to the batter, so the cake tastes amazing and is rich and moist. You can really taste the almond flavor! The cake is sprinkled with caramelized flaked almonds, which are seriously addicting! ½ cup sour cream 12% 4 oz / 115g, at room temperature! 4 large eggs at room temperature! Sour cream and eggs should be at room temperature (it‘s enough to place them in a bowl with warm water for 15-30 mins). Generously butter a 8-inch / 21 cm bundt cake pan. Set aside. 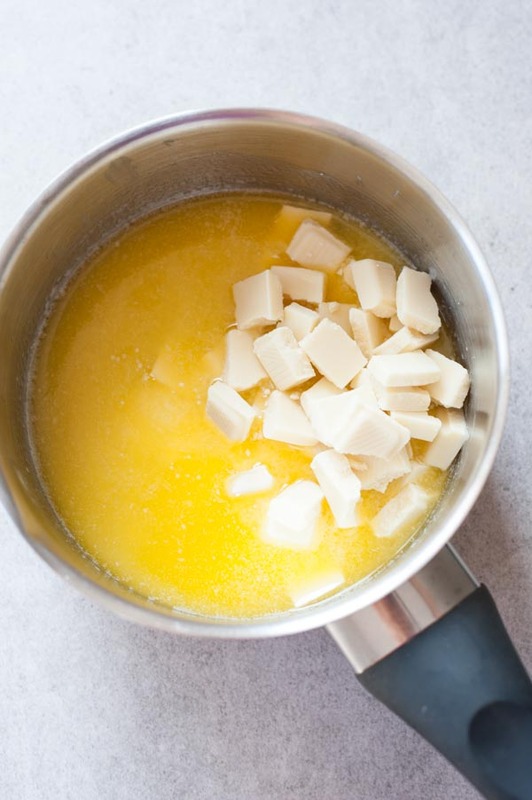 Add the cubed butter into a small pot, cook, stirring, until melted, take off the heat. It should be very warm, but not boiling. Add the chopped chocolate, stir until melted. 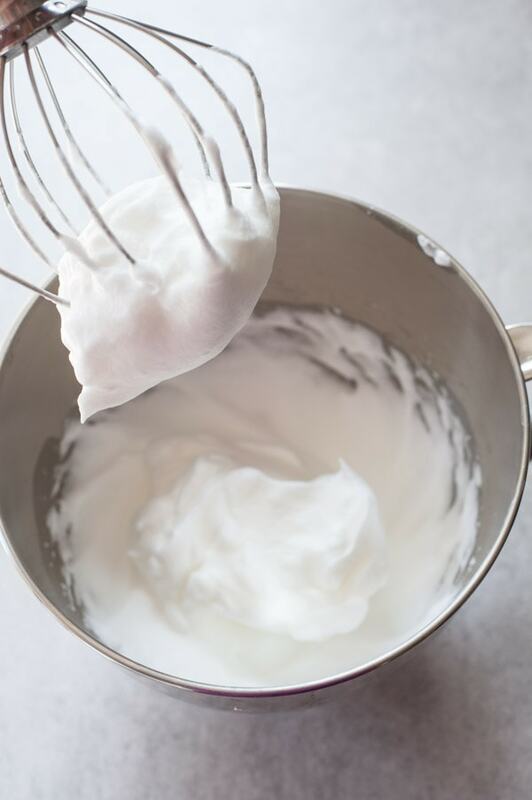 Then whisk in the cream until smooth. Set aside. 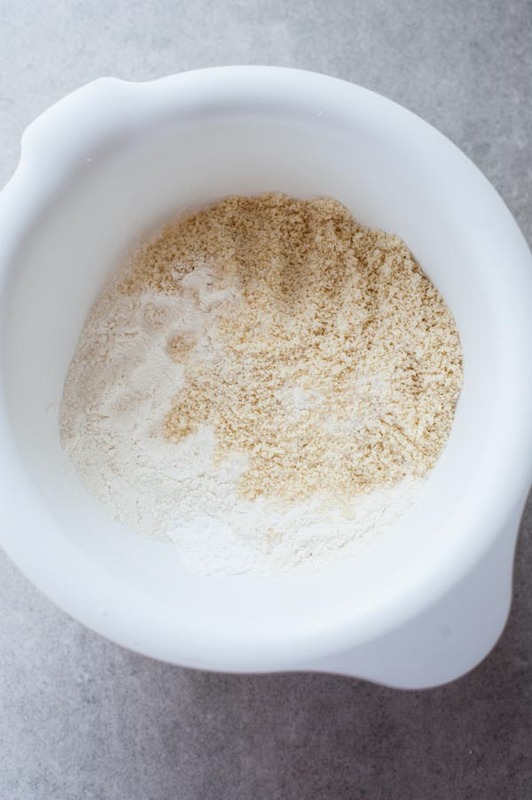 In a big bowl, mix the flour with ground almonds and baking powder together (if you‘re grinding the almonds yourself – they don‘t have to be ground very finely like almond flour). Set aside. 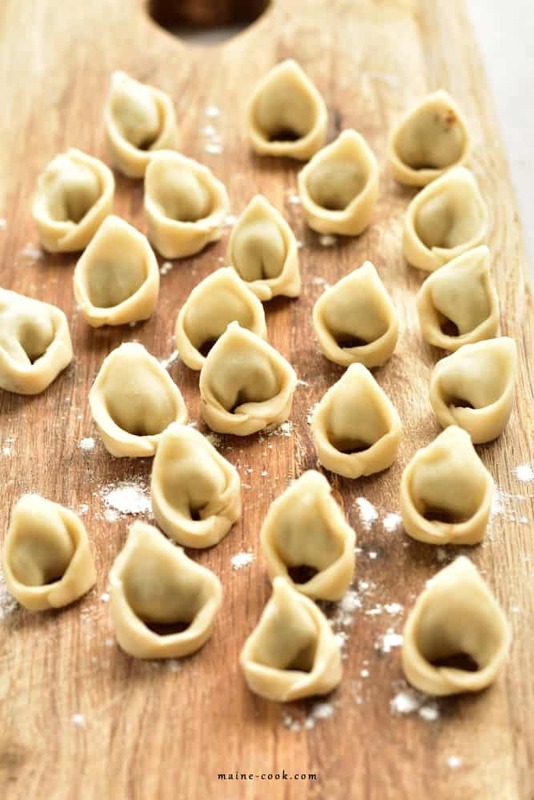 Preheat the oven to 325°F / 160°C / Gas Mark 3, no fan (if you have a convection oven, reduce the temperature by 25°). Separate the eggs. 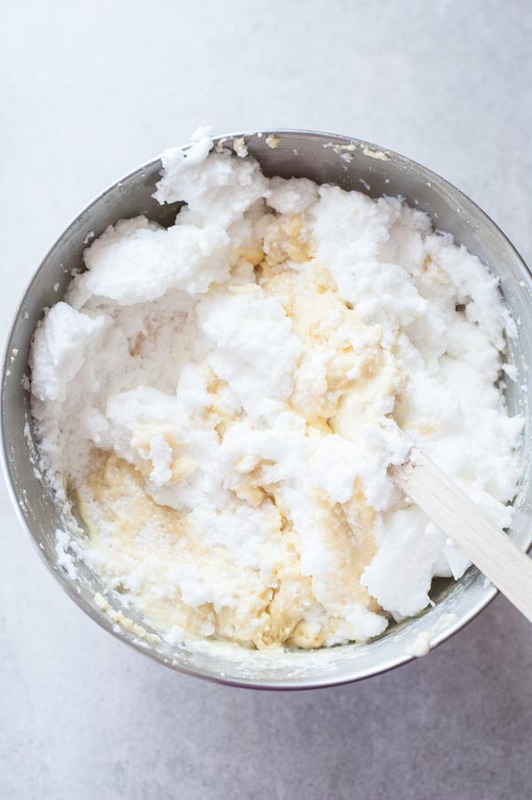 Add the egg whites into a large, clean and dry bowl. 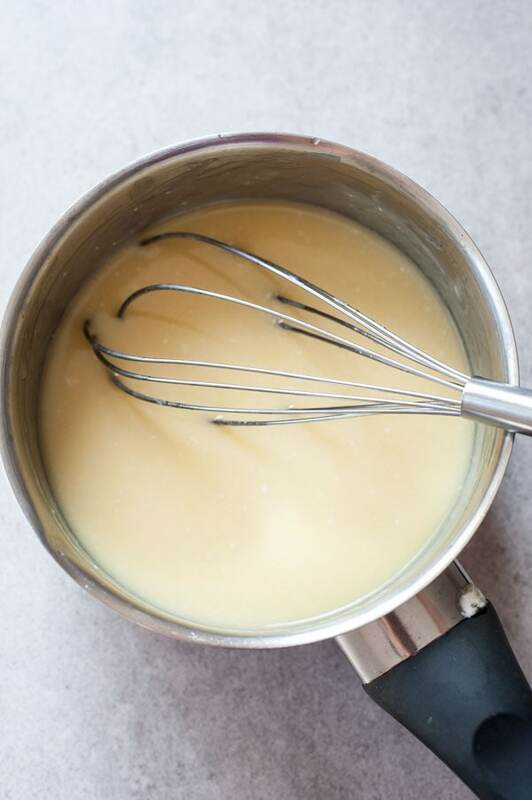 Whisk with a pinch of salt until stiff. 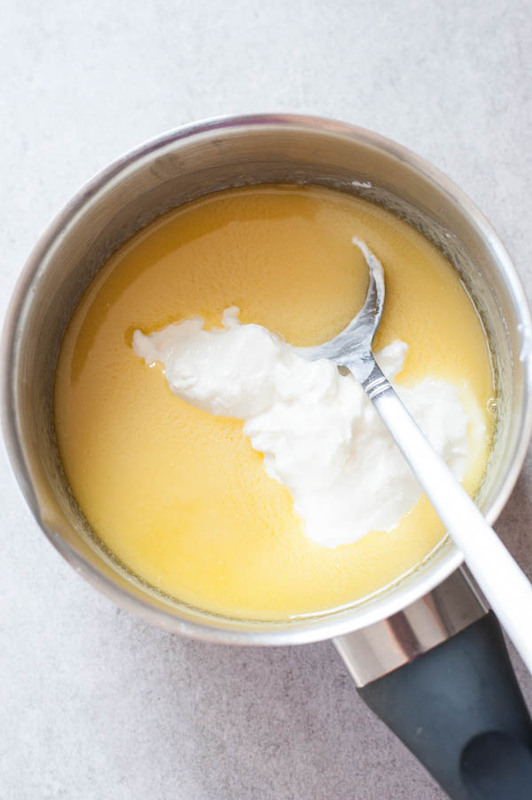 In a separate bowl, beat the egg yolks with sugar until pale and fluffy, about 2-3 minutes (you can use the same whisk attachment that was used to whisk the egg whites). 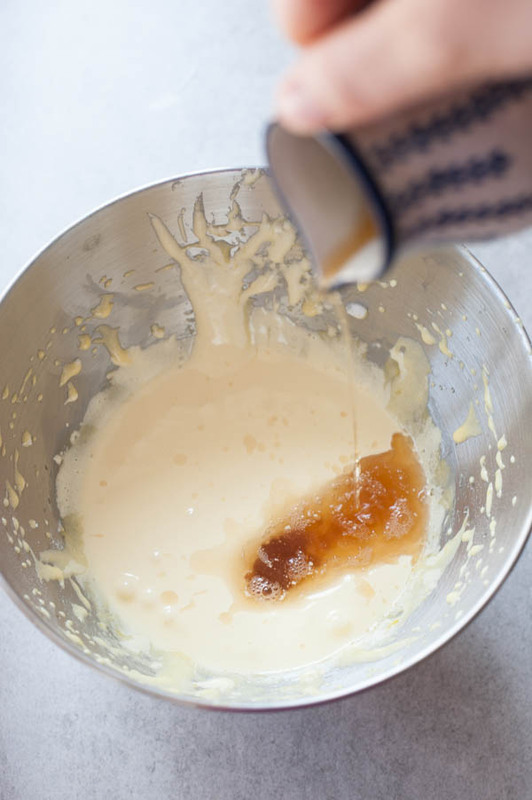 Add the chocolate mixture to the egg yolk-sugar mixture, mix until combined. Then add the amaretto liqueur and vanilla extract, mix. 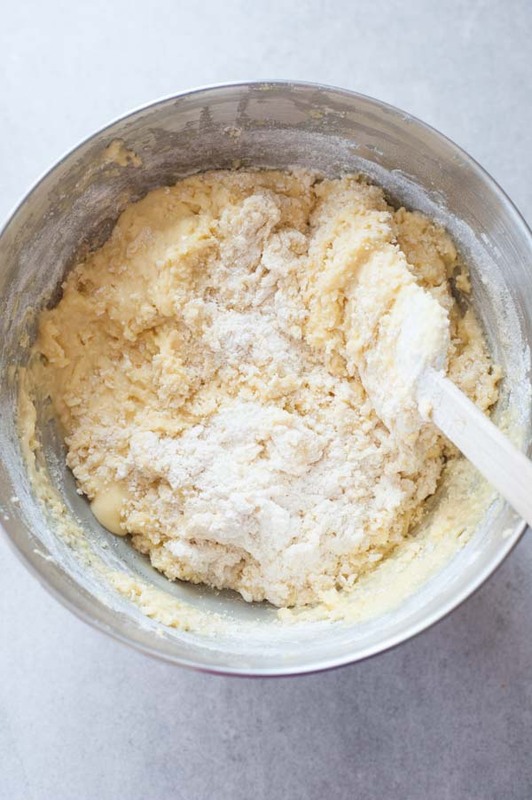 Add the flour mixture and whisk until just combined (don‘t overmix the batter!). Add 1/3 of the whipped egg whites, fold in. 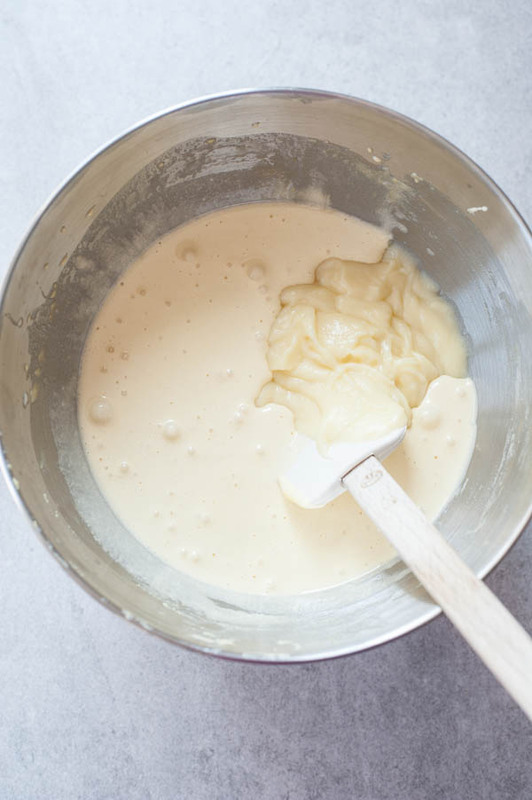 Now carefully fold in the rest of the egg whites until smooth batter forms (be careful not to overmix the batter). Pour the batter into the prepared pan, smooth the surface (try to apply a little more batter at the edges than in the center of the pan). Gently tap the pan on the counter. Put in the oven and bake for about 50 minutes. A cake tester / w wooden stick stuck in the center of the cake should be clean / almost clean. The baking time may slightly vary, depending on the oven. 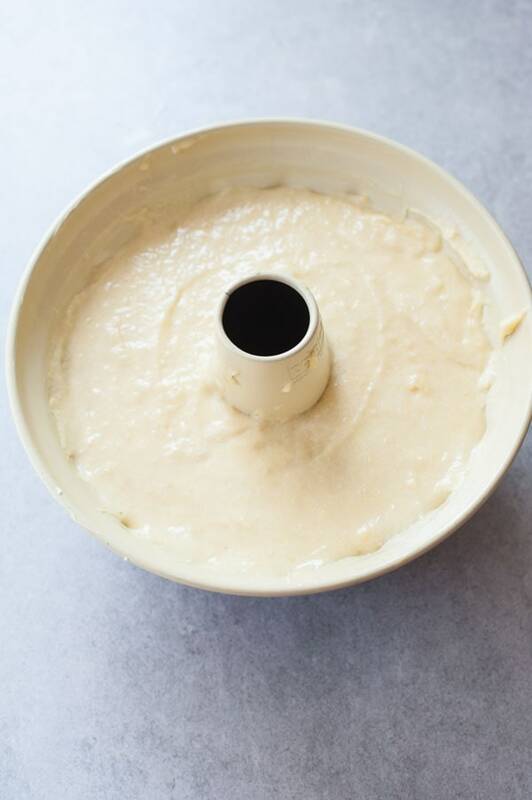 Place the bundt cake in the pan on a cooling rack, leave for 10 minutes, then place on a serving plate and lift the cake pan. Chocolate glaze: chocolate must be melted using the double broiler method. In a small pot, bring water to a boil, remove the pot from the heat (steaming water is enough to melt the chocolate). Place a small bowl over the pot, it should not touch the surface of the water. Add the chopped chocolate and sour cream to the bowl (it‘s good to press the cream through a sieve to ensure it‘s not lumpy). Stir until the chocolate is melted. Drizzle the glaze over the bundt cake. Caramelized flaked almonds: Sprinkle the sugar in an even layer on a pan, heat over medium heat until caramelized (it should be syrupy and golden, but not burned! ), add the almond flakes and butter, mix until combined. 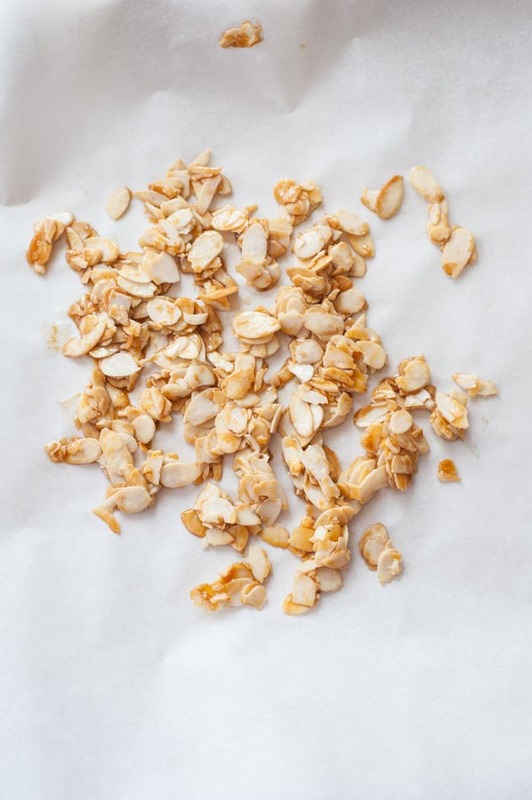 Transfer the almonds onto a piece of baking paper and leave to cool, then break into smaller pieces. Sprinkle over the bundt cake. The cake can be stored for up to 4-5 days, in a tightly closed container, in a cooler place. It tastes best on the day of baking, but it’s also very good on the next day. If the chocolate separates while making the glaze (it will look like grainy lumps that won‘t melt), you still can fix it. How to fix broken ganache: Continue to heat the chocolate in a water bath over low heat. In a second pot, heat a small amount of milk, it should be very warm but not boiling, add it slowly to the chocolate, whisking constantly until the ganache is smooth and glossy. If the chocolate glaze is too thick for you, you can add a little more cream or milk to thin it, but it must be very warm, at a similar temperature like chocolate (otherwise it will split). Caramelized flaked almonds can be made ahead. 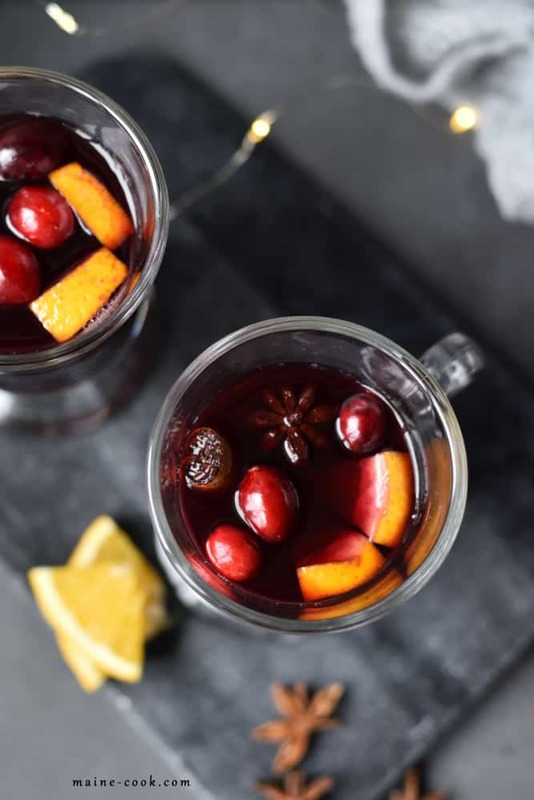 It best to make a big batch and store them in a jar or a tightly closed container (but be careful, they‘re super addictive!). You can sprinkle them on other desserts, such as ice cream.